My wife and I are going on holiday for the next week and a half, so I thought I'd post this early. She may not have opposable thumbs, but she's still a Siren. Bonus high fives to anyone who can guess three of the languages Ruby speaks. Super high tens to anyone who can decode the other two "languages"! Who wouldn't enjoy the solitude of a crow's nest? Time away from the hustle and bustle on and below decks. Time to play your conch, or work on your widdle. When it comes to Chip, she's always got some project to work on. "Now she's a large lass!" "What'd YOU eat for breakfast?" Leave it out. Don't go troublin' Sommer. She's got enough on her mind. Meet Satomi; the Sirens' cook and a general good-vibes type of person. From salted meats to scurvy reducing fruits, Satomi knows how to make 'em taste swell. She grew up with a fleet of Khadi "free folk", unbounded by the laws of nationality, free to sail the world in search of any friendly port. In fact, her family crossed paths with Rose's many a time during their youth. As a former Rouge Lieutenant, Marcelina considers herself to be the most disciplined member of the Sirens. She is practiced in the traditional fencing style used throughout the Navy. She is a crack shot on her Bandaq, able to hit targets at a hundred yards. If she hadn't been uncovered as a woman, she might have just risen to the ranks of Commander. 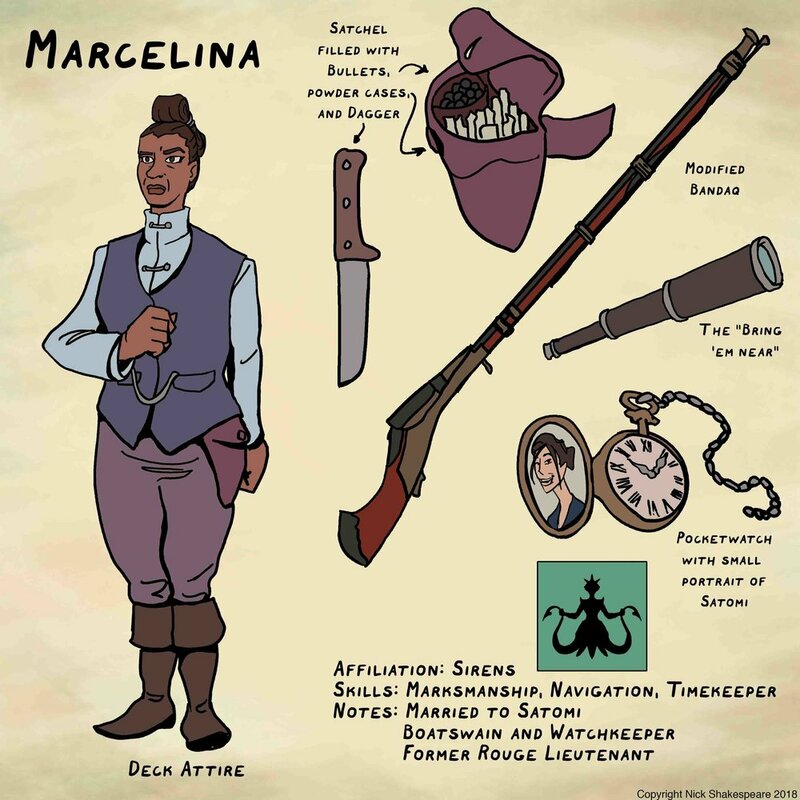 Lucky for the Sirens, Marcelina fled the Rouge long before the gender discrimination laws were scrapped. What a weekend! Saw Ocean's 8. Ran a bunch with my wife. Ate a lot of ice cream. Saw Alt J in concert. Watched a bunch of Daria (Season 1). Walked around Brooklyn and loved every minute of it. But enough about me! Who's this posh little goofball? This aspiring writer wanted more than golden chalices and well piped furniture, so she sprung out in pursuit of adventure! Little did she know how swept away she could get in a life on the sea. I'm going to say every character is my favorite, but Kiri and Zuri might just be my favorite pair. After meeting each other while being separately pursued by various angry crowds, their combined cunning led to their escape. From then on, the two were inseparable, using each other's talents to cover their own weaknesses. Let's keep this going, shall we? Gail's always got some scheme up her sleeve, and most of the time, they pan out just fine. Hello fellow Sirens! Wow, it's been awhile. I'm sorry I haven't uploaded anything in awhile. 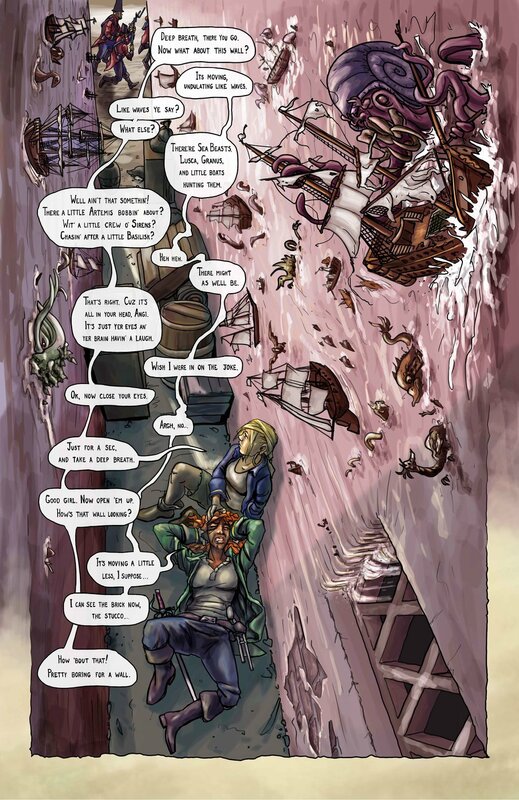 I can't say what caused it, but some time around the Plastic City comic con, I decided to make some great changes to the look of "The Siren's Song." I've been reworking my old pages to fit into the new style. Once I start uploading new and REVISED pages again, you'll get the idea. 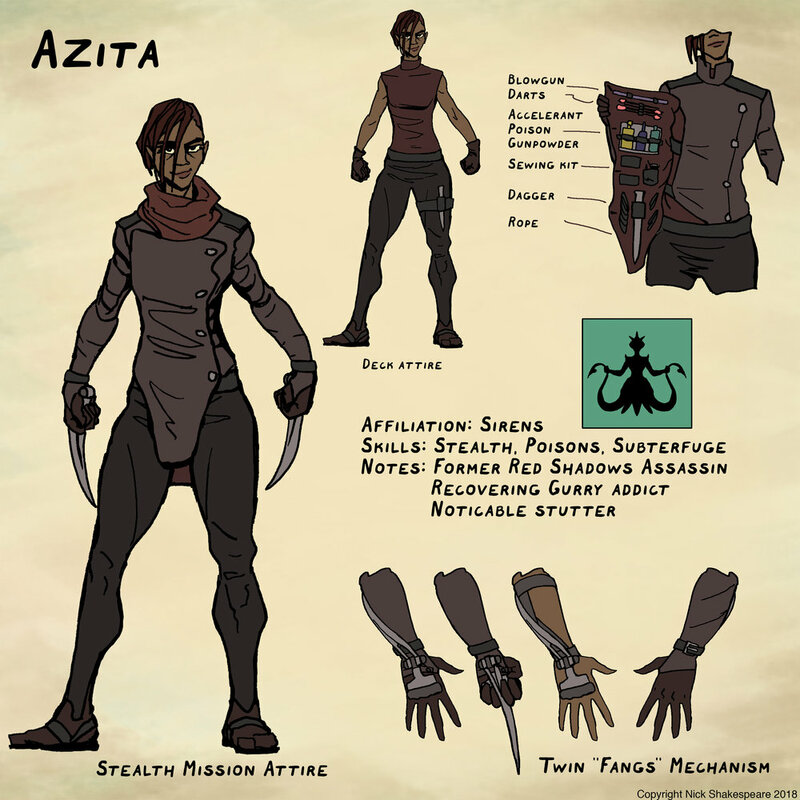 But until then, enjoy this character sheet on one of the more stealthy Sirens; Azita. April 21st! 10am-6pm at the Wallace Civic Center located at 1000 John Fitch Hwy, Fitchburg MA 01420! Plastic Comic Con is finally upon us. 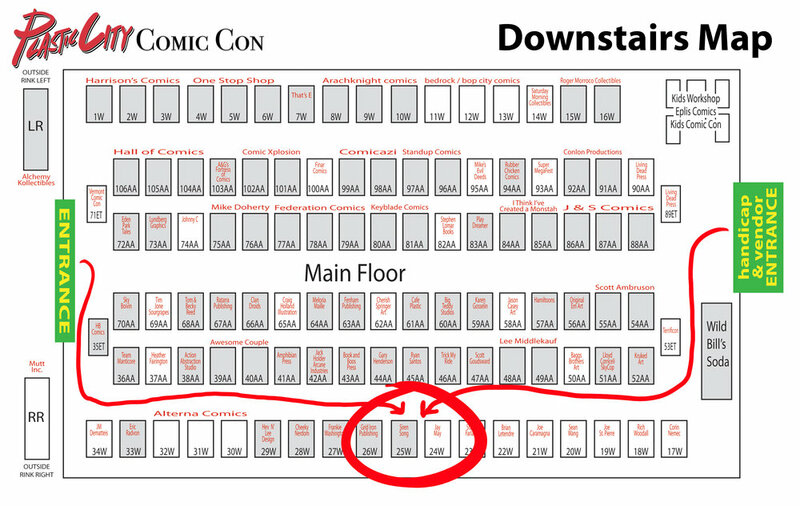 Come find me and a couple of buddies hanging out at booth 25W to get an EXCLUSIVE COMIC CON SNEAK PEAK at The Siren's Song Chapter two: Escape from Haven's Bay!!! It's a cute little booklet with unreleased new pages! 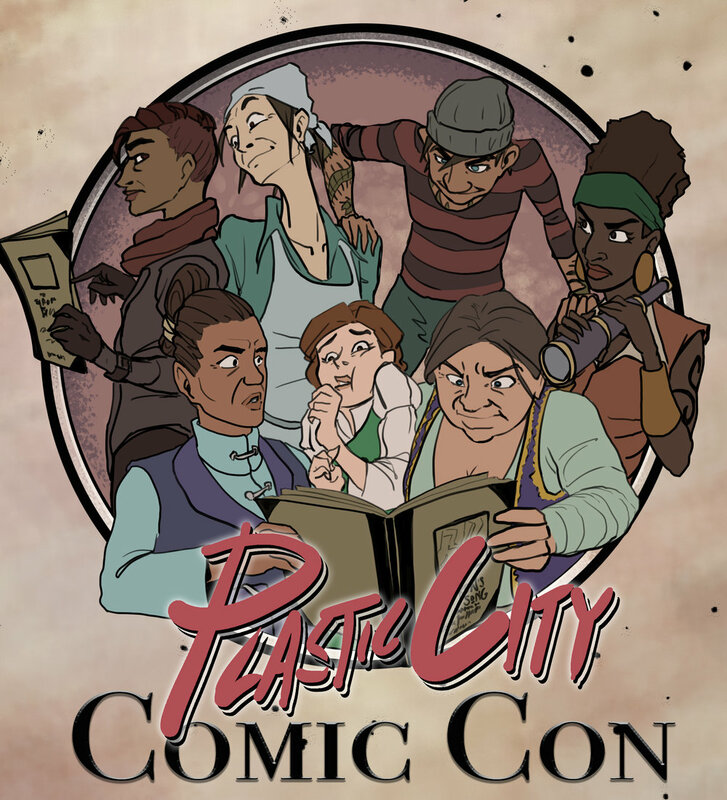 To find out more about the convention, check out www.plasticcitycomiccon.com ! All this time there was a backup plan? In addition to Angila's Boiling-Pot back up plan? As well as the All-Seeing-Eye plan? Can't blame Bethany for not being able to keep up. Let meet some of the Sirens, shall we? Introducing Marcy, Satomi, and Bethany. Escape from Haven's Bay Page 1 !! So excited to finally put this out here! 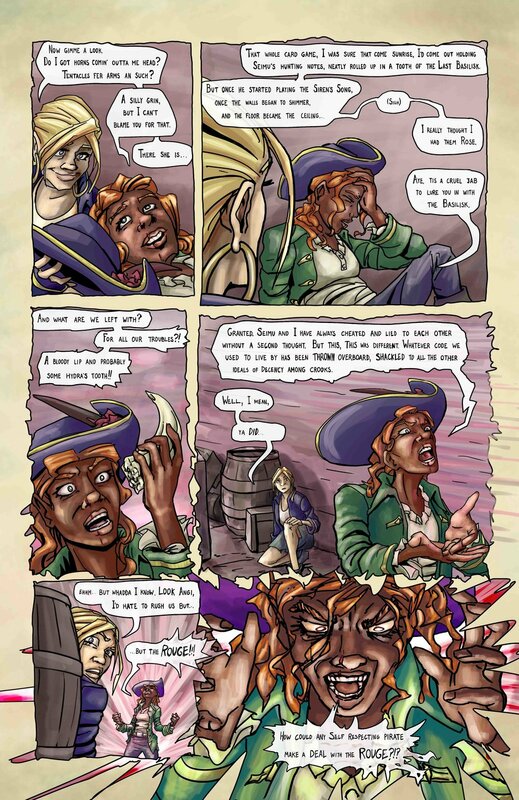 Page one is finished, and page two is on the way! 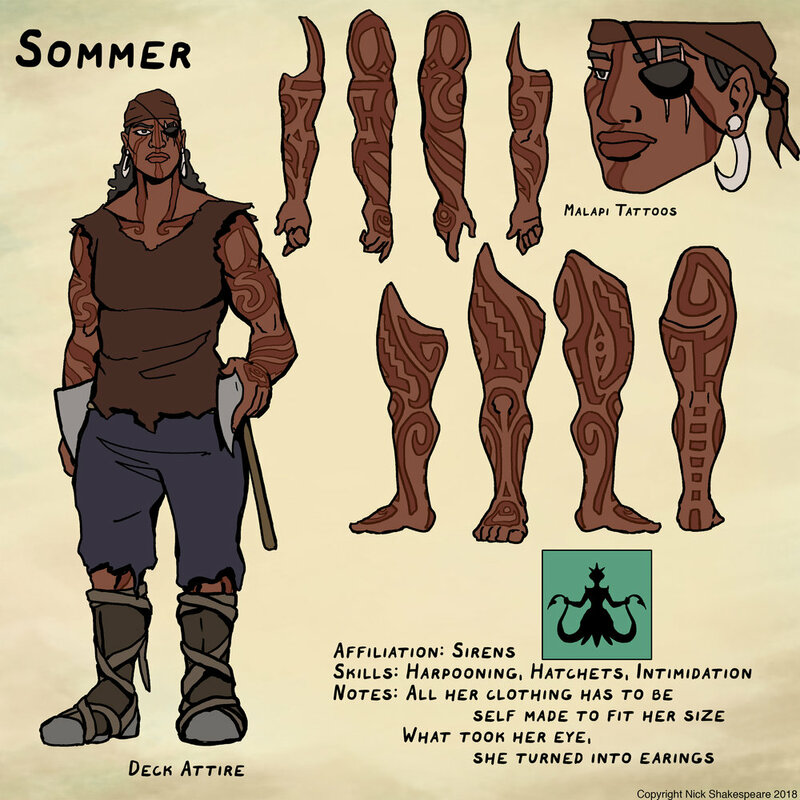 It's been a wild ride getting Chapter Two ready, and I can't wait for you all to meet the rest of the crew ... and find out more about Angila's affliction; The Siren's Song! Eos Almighty! I got invited to the Sci-Fi Saturday Podcast! Check out the link below! The First Annual Keene Comic Con was a blast! In addition to hanging out with my next-door- table mates Ludosport (The International Light Saber Combat Academy), I got to meet the fine folk that run the Sci-Fi Saturday Night Podcast. Long story short, they invited me on to one of their episodes. I talk about storyboards, the TV industry, and of course The Siren's Song. If you've got an hour to spare, or just want to hear my goofy voice, check it out! Hey fellow Sirens! You're free to read online, but if you're like me and enjoy sitting back with a hard copy of a paperback, then jump on over to the store!